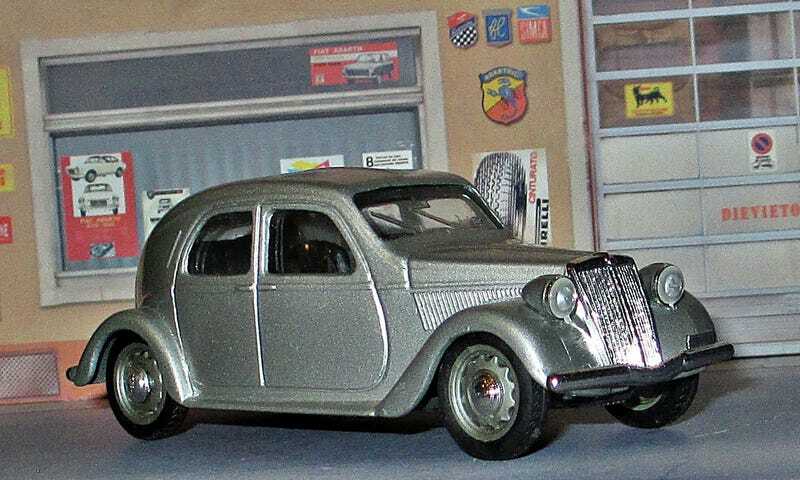 The Lancia Aprilia (1937–1949) was a family car manufactured by Lancia, and one of the first designed using a wind tunnel in collaboration with Battista Farina and the Politecnico di Torino, achieving a record low drag coefficient of 0.47. The berlinetta aerodinamica was first shown in 1936. Production commenced in February 1937, the month in which the firm’s founder died: this was the last of Vincenzo Lancia’s designs, featuring four pillarless doors.. The first series (mod. 238, 10,354 units, 1937–39) featured a 1,352 cc V4 motor providing 47 bhp. The second series (mod. 438, 9,728 units, 1939–49) had its engine capacity increased to 1,486 cc which provided 48 bhp (36 kW). Calling this a “V4" was however stretching it a bit - the angle was extremely narrow. With the Aprilia, Lancia followed their tradition of offering cars with the steering wheel on the right even in markets seen by other manufacturers as left hand drive markets. However, outside the UK and Sweden customers increasingly picked the optional left hand drive versions. A Lusso model of this second series was also offered as well as a lungo (lengthened) version (706 made, 1946–49). A total of 20,082 cars and 7,554 additional chassis for coach built bodies were produced in Turin along with about 700 in France. Lancia had opened their first plant outside Italy at Bonneuil on the south side of Paris in 1931, and the Aprilia was assembled here between 1937 and 1939. The French version was badged as the Lancia Ardennes, but apart from the name and slightly larger headlights (possibly to compensate for the dimming effects of French legislation requiring headlight bulbs to be yellow) the French Lancia Ardennes was indistinguishable from the Turin built Lancia Aprilia. Only 1620 Ardennes were assembled in France, the competition from the Citroen Traction Avant was simply too strong. The model you see here is a 1/43 by Italian maker Brumm from the late 1980s. I’ve always enjoyed Brumm models - while they perhaps look a little dated by today’s standards, I figure their enthusiasm for the subject matter always shows. At the time, this car was regarded by motoring journalists as one of the finest sports sedans around - the Motorsports Magazine website has an original review on its website, and they couldn’t have been more pleased with the car. It’s a far cry from what Lancia has become in recent years. What a shame.